BOJACK HORSEMAN Renewed for Season 6! Good news for animation geeks with a dark sense of humor and intertanglement with existentialism: BOJACK HORSEMAN was renewed for a sixth season! All you need to know about Bojack Horseman’s character is pretty much summed up in the first two lines of their ending theme. “Back in the 90s I was in a very famous TV show, don’t act like you don’t know”. Now this washed up TV actor struggles with the task of navigating through the pain of existence, find meaning and happiness! Ah, life. Honestly, Season 5 didn’t stick with me as strongly as the previous four. It just kind of felt like it didn’t quite get to where it’s normally at...or upon second thought perhaps I just relate less to Princess Carolyn which focused around her this time. She did need some more development and we got it. 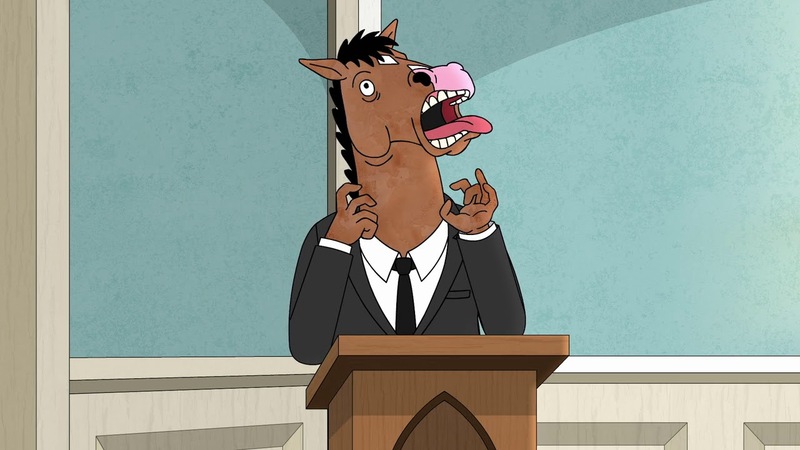 I’m not a fan of seeing Bojack go to rehab, but the show did address the opioid epidemic that is going on in our country. Many people today who are vulnerable to addiction get injured or surgery for one reason or another and are put on painkillers to recover, then they suddenly find themselves still wanting to take them long after their body is healed. BOJACK HORSEMAN is holding an astonishing average of 92% Fresh rating on Rotten Tomatoes, with four seasons at 97% and up, but the first season holds a mere 65%. Five is sitting on 100%! Though I love the show, I’m not sure I agree with that 100% for the fifth season, as I said before it just isn’t as strong as the others. We’ll probably see the next season sometime in September or August. Hollywood Reporter had the story first.